Apple has released the previously announced iTunes Match in beta form today. The service is now available to registered Apple Developers. The iTunes Match service stores your music library in iCloud and allows you to enjoy your music anywhere with your iPhone, iPod Touch, iPad or your computer. 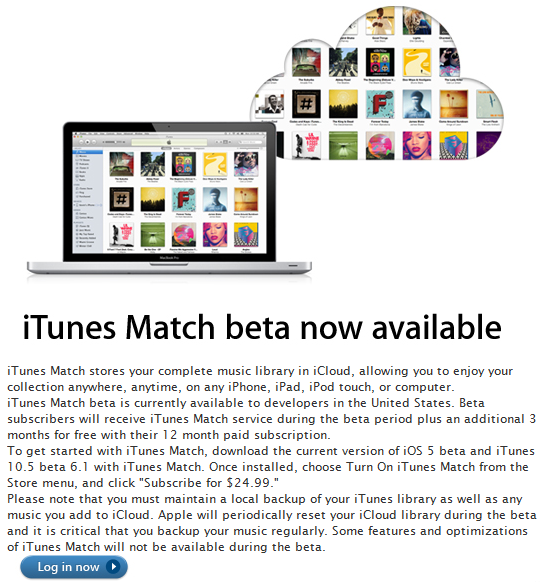 iTunes Match beta subscribers will get the iTunes Match service during the beta period plus 3 free months with their 12 month paid subscription. Some features of the service may not be available during the beta period.